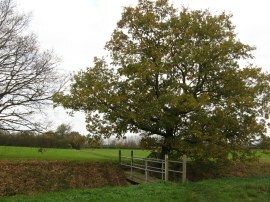 I did this walk on Monday 28th November 2011. 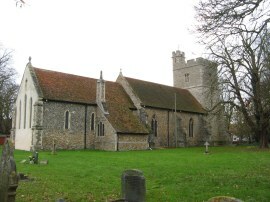 I drove over to Bradwell on Sea where I parked in the small car park at the end of East End Road. 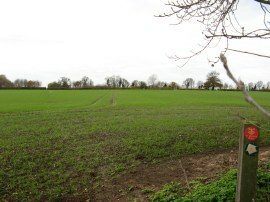 From there it was just a half mile walk along a gravel farm track running alongside a large open field down to the church of St Peters in the Wall, photo 1, which marks the start point of the St Peter's Way. 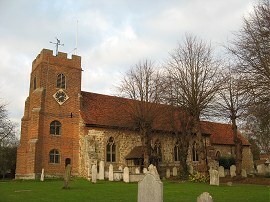 The church was originally built by St Cedd in 654AD using the stones from the nearby old Roman Fort of Othona and the Grade I listed building is among the oldest largely intact Christian church buildings in England that are still in regular use. 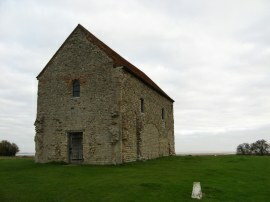 From the church yards it is just a few yards to the edge of the saltmarsh that lines the edge of the coast here. 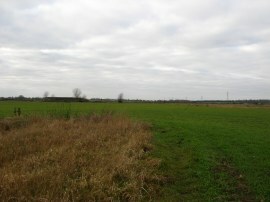 The shorefront is part of the Bradwell Cockle Spit National Nature Reserve which consists of some 30 acres of shell bank together with extensive saltmarsh on the Dengie Peninsular. Here I followed the route as it heads to the right, past the buildings of the Bradwell Bird Observatory to join a footpath running along the top of the flood bank with marshes to my left and open fields away to the right, photo 2. This was the first cold day that I had been out walking in for some time, the car thermometer showing only 6c when I had parked, even though it was after 10 o'clock when I had arrived. There was also a fairly strong breeze helping the air feel cooler although the air temperature warmed up considerably while I was out walking. 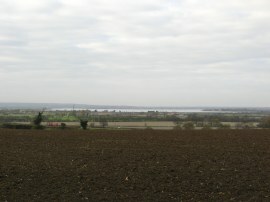 The whole area is very flat and there were far reaching views across the surrounding countryside. Away to my left, out at sea, I could see a wind farm had been built which I don't remember seeing when I was last here back in 2007 when I had done a circular walk from Bradwell Power station , which is now in the process of being decommissioned. It was low tide and there was quite an extensive area of mudflats beyond the saltmarsh before I could actually see any seawater. 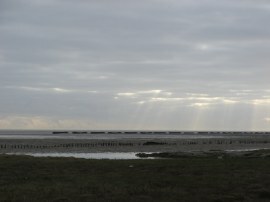 In the distance was a line of concrete barges, placed on the coast to help prevent erosion, photo 3. The flood bank is followed for just over two miles as the path heads out closer to the sea for a while before heading back again. Where the flood bank curves round to the left to head back towards the sea for a second time the St Peter's Way heads down from the flood bank to join a concrete farm track that continues ahead, photo 4. It was at this point that I saw my first somewhat faded way mark for the St Peter's Way. A short distance further on, at a junction of tracks, the route heads to the right along a surfaced driveway heading inland. There was a marker post at the junction and in between two very faded St Peter's Way signs was a bright shiny new red disc. As I continued my walk it became clear that Essex County Council have done a bit of work re-instating way marks along the route which had been very few and far between when I had last walked here. It will be interesting to see if this applies to the whole route of the walk. There is also a PDF for the walk which was published in July 11 which can be downloaded from their website. Where this path bends to the right the route continues ahead through a short field and then into another larger field where the path follows the right hand edge of the field. 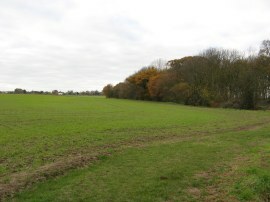 At the end of this field the route heads through a metal kissing gate into another field where the route heads sharp left and follows the left edge of the field alongside a rather overgrown and large drainage ditch. Where the drainage ditch ends the footpath continues ahead across the open field, heading towards two small trees a few yards down on the right hand side of an isolated barn, photo 5. 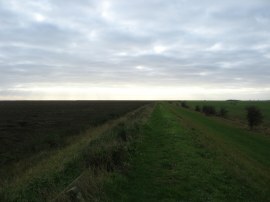 The grass on the seawall had been covered in dew which had made my shoes and low part of my trousers quite damp however fortunately the mud in the field was dry enough not to stick to my boots. Reaching the edge of the field the route heads to the left along a farm track that passes round the back of the barn. 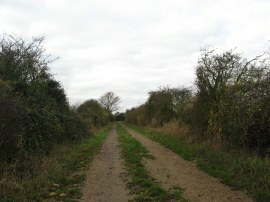 This farm track, photo 6, is followed as it winds its way between fields to Dots and Melon Farm. At one point on the map the route is shown as heading diagonally across a field although, like last time, I could see no trace of this path on the ground nor any signposting at either end and I stuck to the farm track. 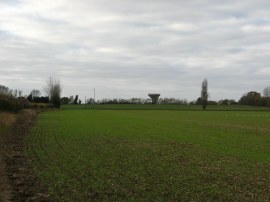 After passing between the buildings of Dots and Melon Farm the route continues ahead along a minor road, passing a scattering of isolated houses. Where this road bends to the left the route continues ahead along a broad path running along the edge of a field, photo 7 although I could not spot a St Peter's Way sign at this junction. 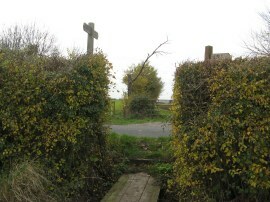 This stretch of path is followed along the edge of a couple of long fields to the village of Tillingham and St Nicholas Church, photo 8. 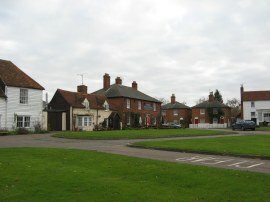 The route heads through the churchyard and out on the village green, photo 9, although as usual the best views were obscured by parked cars. 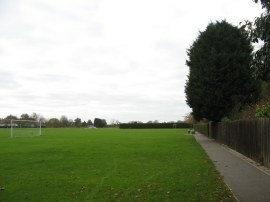 Reaching the B1021 North Street the route heads briefly to the right then left through the Westfield Car Park to join a paved track running alongside the edge of some playing fields, photo 10, where there were also some handy public toilets. Where the tarmac path turns to the right the route continues ahead along the edge of the playing fields, past the buildings of Tillingham Bowls Club to join another field edge path continuing ahead. The route then takes a fairly straight course as it makes its way between fields, crossing over a small wooden footbridge, photo 11, as it makes its way over towards St Lawrence, including a rather smelly interlude as the path passes a short distance away from some barns although I have no idea what they contained. Heading past a small patch of the trees the route then heads through a gap in the hedge by the junction of Reddings Lane and the St Lawrence Road which the route then follows, continuing ahead. 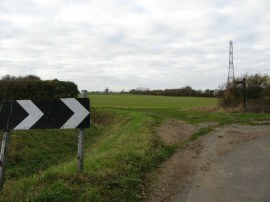 Where this road bends round to the right, photo 12, the St Peter's Way continues ahead into a field, heading to the left for a few yards and then following the field edge round to the right. 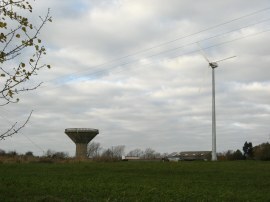 The path heads under the old electricity pylons coming from the Bradwell power station with a water tower prominent on the horizon, photo 13. Reaching a driveway the route continues ahead to join a path across the middle of the next field. Leaving this field the route then heads over a small wooden footbridge and along the right edge of another field until level with the water tower, photo 14, where it heads straight across the remainder of the field, photo 15, to reach the Southminster Road, photo 16, which is where I finished this stage of my walk along the St Peter's Way having walked 7.05 miles along the path. On the other side of the road where good views down over the Blackwater Estuary, photo 17, but for now I turned round to start making my way back to the car. 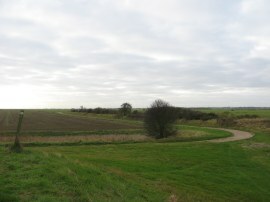 Apart from the field where I turned round, and a short stretch of path near Tillingham I was able to walk back along different paths to those I had walked out on although I did end up with a rather long stretch of road walking through Bradwell, photo 18, towards the end of the day. Reaching the car I had walked a total distance of 14.2 miles. As usual I have uploaded the route of the walk which can be accessed here: St Peters Way Stage 1 Route. The St Peter's Way is a path I had been meaning to walk for some time and it was good to finally get started, even if for today I had already walked exactly the same leg before and it was only my return journey to the car that was different. I am however looking forward to walking a new section of the path on the next stage before too long although the opportunities for a circular walk do seem to be severely limited.